You don't need to be restricted by Cathay Pacific's baggage allowances. In fact, you can avoid having to check in any baggage at all by simply sending your baggage to your destination with Send My Bag. This is particularly handy if you are going on a long trip or if you are moving abroad. You can use Send My Bag to send everything to your destination, while you get to travel light. Find out about Send My Bag's great-value shipping options by calculating your free quote. One item of hand luggage, 56 x 36 x 23 cm (22 x 14 x 9 in). Economy: 7 kg (15 lbs); Business: 10 kg (22 lbs); First: 15 kg (33 lbs). PLUS a small personal item, 40 x 30 x 15 cm (16 x 12 x 6 in). You may bring small musical instruments on board as part of your carry-on baggage. They must not exeed 7 kg in weight or dimensions of 93 x 39 x 24 cm, including the case. Alternatively, you can purchase an additional seat for your instrument, providing it does not exceed 136 x 48 x 44 cm and that it does not weigh more than 32 kg. Economy: two bags weighing up to 30 kg (66 lbs) in total. This increases to 35 kg (77 lbs) in Premium Economy, 40 kg (88 lbs) in Business Class, and 50 kg (110 lbs) in First Class. First Class passengers are permitted three bags in total. Bags cannot exceed 203 cm (80 inches) in total dimensions and no single bag may weigh more than 32 kg (70 lbs). Infants that do not have a seat but are travelling on an adult’s lap have an allowance of two bags, with a combined weight of no more than 10 kg (22 lbs) in total, plus a car seat and stroller. If an infant is travelling on your lap, you may check in up to two pieces of luggage for the infant, together weighing no more than 10 kg. You may also check a car seat and a buggy/ stroller. 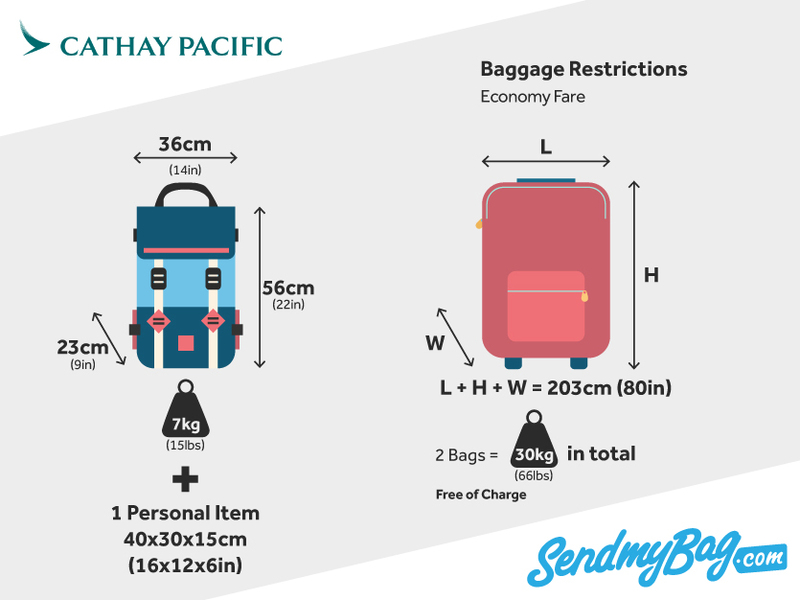 If you have luggage that exceeds Cathay Pacific’s inclusive checked baggage weight allowance, you must pay a fee, which varies according to the route travelled. On most routes, prices range from 10 USD per kg to 60 USD per kg. Sports equipment is accepted as part of your checked baggage, provided it fits within the above size and weight restrictions. Oversized items will incur excess baggage fees. If travelling with a bicycle, you should contact the airline as far in advance as possible to ensure there is space for your bike on the aircraft. Looking for Cathay Pacific sized hand luggage?